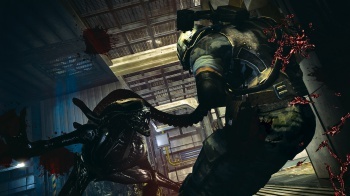 An anonymous Redditor claims to have the inside scoop on why Colonial Marines came out half-baked. First of all, you need to take everything you're about to read with a grain of salt. With that in mind, an anonymous poster on Reddit - who claims to have been involved with Aliens: Colonial Marines for the last year and a half of its development - has posted a long and rather detailed account of the seemingly endless bad fortune the title encountered during its ridiculously long development cycle. We have no way of verifying the integrity of these claims, and the poster notes right off the bat that they must keep their identity secret to avoid legal action. However, the detailed account does elevate the story above what you might expect to see from a disgruntled fan trying to spread nonsense. "Pecan (the internal codename for ACM) has a pretty long history. SEGA, GBX and 20th Century FOX came to an agreement to produce an Aliens game around 6 years ago, after which SEGA almost immediately announced it, long before Pecan had even started production," the poster explains. "The game has been in active development in the past, only to be shelved in favor of another project (Borderlands, Duke, etc), and each time it was resumed it would undergo a major content overhaul." He or she goes on to detail how Colonial Marines was constantly put on the back burner in favor of other projects. According to the poster, the story campaign was only 85% finished with just four months left before the game had to ship, and the story - which absolutely butchers Aliens canon - was still in shambles. "Campaign didn't make much sense, the boss fights weren't implemented, PS3 was way over memory, etcetcetc. [Gearbox] was pretty unhappy with [TimeGate]'s work, and some of Campaign maps were just completely redesigned from scratch. There were some last minute feature requests, most notably female marines, and the general consensus among [Gearbox] devs was that there was no way this game was going to be good by ship. There just wasn't enough time." But the game did ship, and as review scores across the board have shown, the game suffered because of it. You can read the full, much longer rundown on the original post. Again, it's impossible to tell whether or not this story is legit or not, but the explanation does certainly seem to fit with how the final product turned out. What do you think? Is this a sad love letter to disappointed fans, or a particularly creative forum troll trying to smear one or more of the companies involved?